Spatchcock (or spatchcocked) may be a funny-sounding term to describe butterflied poultry, but there's nothing funny about how great it will taste. Spatchcocking is a method of preparing a chicken, turkey, goose or duck. The process basically entails the bird being butchered in a way that allows it to be splayed flat for cooking. As a result, the bird's cooking time is much quicker than a whole chicken. Once you have butterflied or spatchcocked the bird, you can roast it in the oven or put it on your bbq grill or stovetop flat grill. The process of spatchcocking a chicken may sound a tad intimidating, but you should be able to take on the challenge immediately. Once you've done it a few times, you'll see that it really does get easier every time -- just like when you first learn how to cut up a whole chicken on your own. However, if you don't want to take on the spatchcocking yourself, you can ask the butcher at your grocery store to do it for you. First, spatchcock the chicken. Once the chicken is prepared, use your fingers to gently pull the skin away from the meat slightly, enough so you can slide your hands underneath. Set the chicken aside on a baking sheet. Juice the lemon halves and set the juiced lemon rind aside. In a bowl, combine the lemon juice with the celery leaves, minced garlic, spring onions, red chile, salt, and black pepper. Give the ingredients a good stir, then taste and adjust the ingredients if desired. Next, use a spoon to coat the chicken meat under the skin and throughout the entire chicken. Then coat and rub the sauce ingredients all over the outside or on top of the chicken skin -- make sure to cover as much of the meat as possible. Grab the lemon halves you juiced and slice them into even slices. Place these lemon slices underneath the skin and on top of the breasts and thighs. 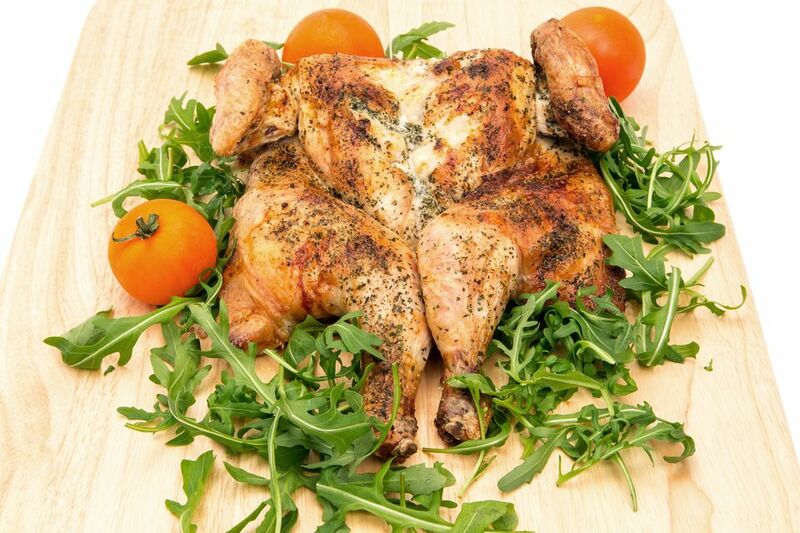 Place the chicken in the fridge for 30 minutes before roasting or grilling. Roast in the oven at a temperature of 400°F for 45 minutes. (You can also place it on the grill to cook.) Your roasting time will depend on the thickness or weight of your chicken. Make sure that the juices run clear in the thighs before removing from the oven. Serve with desired side dishes.